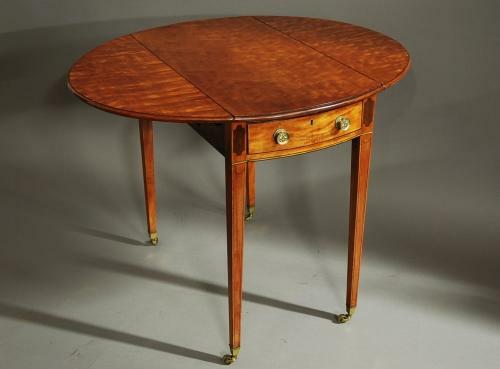 This table consists of a well figured solid satinwood top with a moulded edge. Underneath, the supports are of bow form with a bow shaped drawer with ebony line decoration and decorative brass handles with a dummy drawer to the opposite side. The base has various string decoration of boxwood, ebony and mahogany with an inlaid design to the top of the legs. The legs are of tapered form terminating with original brass castors. Provenance: this table was sold in the 1990's by a local respected BADA antique dealer, Randolf Antiques in Hadleigh, Suffolk who regularly exhibited at The Grosvenor House Antique Fair for many years.